Take a look around you. How many objects around you have plastic parts? Plastic is now omnipresent in our lives, from our cutlery to our accessories, our toys to our most advanced technology. It’s in our lunchboxes, bathrooms, kitchens and closets, gardens, toolsheds, and even our bedrooms. It’s given us so much in the 80 years it’s been available, and allowed us to learn the true meaning of convenience-having everything cheap, readily available, and good to take anywhere. You’d think we should be grateful for all plastic has done for us, but plastic has a downside too. Plastic products were created to help us-but unlike other materials, plastics don’t degrade and disappear after we’re done using them. Here are some facts and history about plastic products, so that you have a good understanding of why they are an important topic in ocean literacy. Tomorrow, we will be providing you with activities and materials you can use at home or in the classroom about plastics and the marine environment. Are there ways to stop using plastic? It is difficult, but the answer is yes. On Thursday, we will provide you with some resources you can use to begin living a less plastic filled life. We will also be talking about how you as a consumer can help influence producers to reduce their use of plastic, so that you can get more of what you want, without plastic guilt! casein materials, and proteins. [Plastics are] used in place of other materials, [like] glass, wood, and metals, in construction and decoration, for making many articles, as coatings, and drawn into filaments, for weaving. 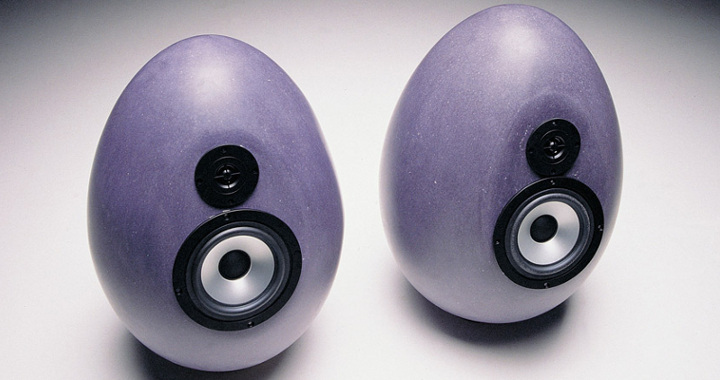 They are often known by trademark names, as Bakelite, Vinylite, or Lucite." Plastic is an inorganic, man made compound that is most often produced as a byproduct of oil or petrochemicals. Each plastic type is different, but all plastics are essentially chains (polymers) of carbon-based units known as monomers. The monomers, or repeating molecular units, of plastic often contain carbon along with hydrogen, sulfur or oxygen or nitrogen. The combinations of these elements into linking chains determines the type of plastic produced, and it's associated properties. How many types of plastic are there? The amazing thing about plastics is that they can be used for so many things. Plastics can be made to suit almost any purpose, which means that there are hundreds of different types and subtypes of plastic in the world. 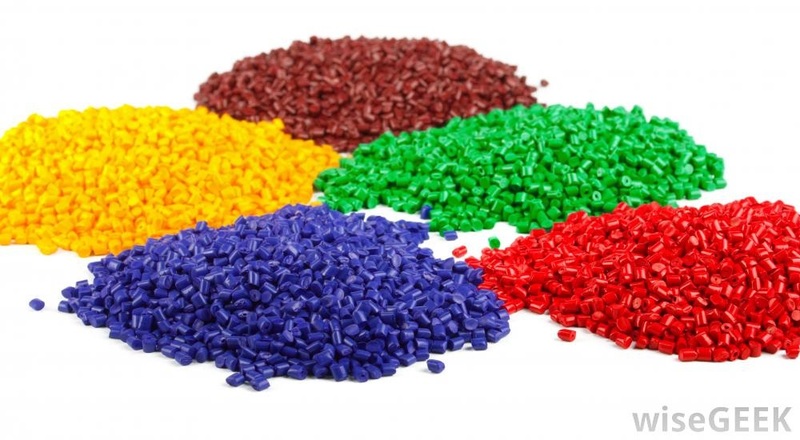 There are two main categories of plastics: Thermoplastics (plastics that can be melted and remelted to return to their original state) and Thermosets (plastics that are set using heat into one particular shape and cannot change form. Read more about these categories on the How Stuff Works blog. Because there are so many types of plastics, The Society for Plastics Industry developed a categorization system to help broadly identify the type of plastic used in products you might purchase or have in your home. You probably recognize the symbol they chose to help define the category- it looks an awful lot like the recycling symbol, right? Despite all plastics in the home bearing this symbol, it's presence on the products doesn't necessarily denote that a container is recyclable. Learn about what these symbols really mean on The Daily Green blog. Check out the Wisegeek blog for more details on this process.Thermoplastics that are used for household products can be broken down, cleaned,melted, and recycled into preproduction pellets, known as "nurdles". These nurdles can then be remixed and used to create new products, like fleece, carpeting, and constuction materials. Plastics can now even be used to make useful things like jeans, chairs and even bridges. What is the future of plastics? Plastic is now a cultural addiction, and it's starting to show. Plastic can now be found even in the most remote environments on earth, and has become a serious problem. Solutions are starting to emerge though. Akinori Ito, founder of Blest Corp. in Japan, has developed a portable machine that takes plastic and converts it back into oil, so that it can be used again. Thermoset plastic refuse can also be used to recreate petroleum products. Companies like Algylix are able to take used plastics from garbage dumps and landfills, and create useable crude oil from them. This may revolutionize the way we recycle in the future! We'll have more on plastics and what they are doing in our environment tomorrow, along with ways you can teach your community about them. Stay tuned! 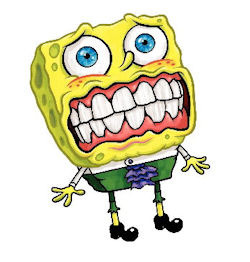 Are plastic spongebob toys killing other ocean creatures? In the last year, I have been sponging up information about the growing problem of plastic pollution in our oceans. Through my work in the Great Lakes with Pangaea Explorations, I got to meet and learn from members of the 5 Gyres Institute, a leading research group studying oceanic plastic pollution, and find out how serious the plastic pollution problem really is. What I learned from them shocked and saddened me. Did you know that our consumption of plastic products is literally turning parts of the ocean into garbage soup? It's true. Everyday plastic products are intentionally and unintentionally discarded into our lakes, sewers, and coastal waters. As water flows downstream plastic debris is often carried out into our beautiful oceans. Many of the plastics found in the ocean float; plastics like Polypropylene and Polystyrene for example. Others, like Polycarbonate and PETE, sink under the surface. Plastic is not an organic material, and therefore will not biodegrade in ocean water- wave action and sunlight will simply break plastic products into smaller and smaller pieces over time. Some of these pieces are so small that they are known as "microplastic particles" invisible to the human eye, but tasty looking to tiny fish and other marine creatures. These floating pieces of plastic are subject to the natural forces of the ocean: winds, currents, and tidal movement. Many of these little pieces end up congregating in areas of the ocean known as Gyres or Patches. A visualization of the Pacific Garbage gyre from wikipedia commons. According to National Geographic, "An ocean gyre is a circular ocean current formed by the Earth’s wind patterns and the forces created by the rotation of the planet." In these areas of the ocean, used and discarded plastic materials end up hanging out together in these natural whirlpools, creating plastic soup- a mix of seawater, plastic, microscopic species and algae. So why is Plastic Soup a problem? Well, would you want to eat plastic soup? Neither do the wildlife of the oceans-our birds, invertebrates, mammals and other species that rely on the ocean for food and protection. Even though plastic isn't an organic material, it does a pretty good job of fooling animals into thinking it's food. Many species in our oceans have been found choking or dying on plastic products that they mistakenly identified as a tasty treat. Plastic Soup- look delicious to you? Check this video from One World, One Ocean in which the crew from the 5 Gyres Institute discuss the issue. We are all responsible for this problem, as I learned earlier this year through a particularly embarrassing experience on Sea Dragon. "Plastic Plunders: A Wake up Call at the Miami Strictly Sail"
So, its up to all of it to figure out a solution. "How do you envision the future?" 1) Reduce or stop our use of plastic products by creating biodegradable or functional alternatives. 2) Find a way to remove the plastic material from the ocean water without harming the natural environment. Do those seem like challenging tasks? Well, they are. But in my opinion, the most challenging tasks are usually the most important! What gives me hope about accomplishing these tasks is that the world is already stepping up to the challenge. Check out the articles and resources below to learn about how we are meeting these challenges head on!! Support companies and restaurants that use biodegradable packaging! Restaurant's like Quizno's are leading the way by using biodegradable alternatives at all of their outlets.Check out this cool blog by Trendhunter that describes some really cool packaging alternatives, including ones you can plant. Encourage businesses to use biodegradable alternatives to plastic packaging. You can start by signing our petition for Booster Juice! 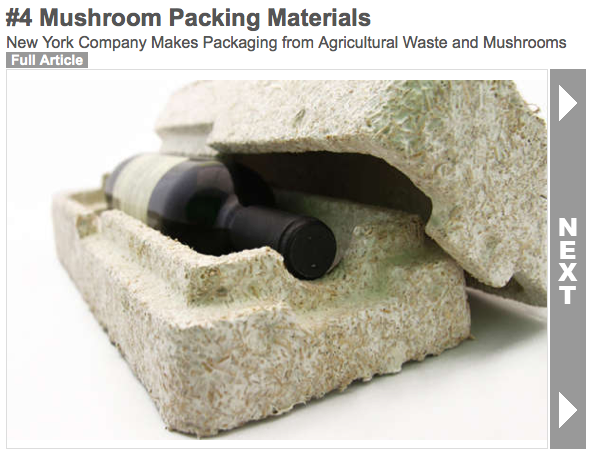 Buy your home products from companies that use biodegradable packing materials- check out Ecovative Solutions and theirmushroom packaging material, already in use by a number of fortune 500 companies. Continue to read and research new plastic alternatives. For example, check out ZEOFORM: a compostable plastic material that can be used to form almost anything! Challenge 2: Find a way to remove the plastic material from ocean water without harming the natural environment. This challenge is quite a bit harder, I think- how do you remove billions of tiny particles of plastic from a fluid, moving environment? How can you do so while also protecting the many different microscopic and delicate species found in ocean water and soil? Boyan recently spent some time on board Pangaea Exploration's sailing vessel Sea Dragon to try out his new multi-level trawl prototype! Check out his work on Pangaea's Blog. We're still a long way from solving our plastic soup problem, but that doesn't mean solving it is impossible! If we put our energy, time and efforts towards cleaning up our oceans, I truly feel that we can reverse the plastic soup. My hope is that you do as well. Asta has a Master's degree in professional science. Part of her degree program she studied microplastic pollution in the oceans and Great Lakes.